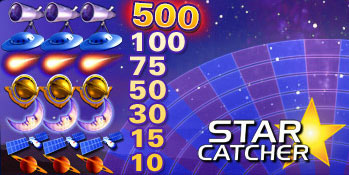 Star Catcher slots is an amazing bonus 3 reels slots game, released by the famous creators of online slots games – Cryptologic, or also known as Wagerlogic. The game has 3 reels and its big jackpot is of the very generous amount of 2500 coins. The second jackpot is of 500 coins, which is pretty decent for a bonus slots game. The only coin size you can use is $1, which is pretty okay but doesn’t give you the opportunity to bet low. The max coin amount you can bet is 3 coins. There are 7 winning combinations in the game, which in combination with the three reels, the three paylines and the six symbols, I think it gives you a fair chance of winning. The symbols are obviously space related and are a telescope, UFO, a comet, a moon, a spaceship and Saturn. There aren’t any wild or scatter symbols, or multipliers. However there is an autoplay mode and a bonus game on the second screen called Star Catcher Bonus Round.